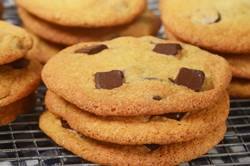 Chocolate Chip Cookies: Preheat your oven to 375 degrees F (190 degrees C) and place the oven rack in the center of the oven. Line two baking sheets with parchment paper. In the bowl of your electric stand mixer, fitted with the paddle attachment (or with a hand mixer), beat the butter until smooth. Add the white and brown sugars, and vanilla extract, and beat until smooth and fluffy (about 1 - 2 minutes). Add the eggs, one at a time, beating until incorporated. Scrape down the sides and bottom of the bowl as needed. For large cookies, drop about 2 tablespoons of batter (35 grams) (can use an ice cream scoop), onto the prepared baking sheets, spacing them several inches (about 7.5 cm) apart. With the palm of your hand, gently flatten each ball into a round. If desired, gently press four or five chocolate chunks or chips into the batter. Bake about 10 - 12 minutes, or until golden brown around the edges but the centers will still be a little soft. Cool completely on wire rack. Note: You can freeze this dough. Form the dough into balls, flatten slightly, and place on a parchment lined baking sheet. Freeze and then place the balls of dough in a plastic bag, seal, and freeze. When baking, simply place the frozen balls of dough on a baking sheet and bake as directed. You may have to bake the cookies a few minutes longer than stated in the recipe.